Making the move to San Francisco was in large part due to the friendships I made playing in the Sun Valley Summer Symphony with Bay Area musicians, over a period of 15 years. Two of the best friends I met and connected with were Bill Everett and Aileen Chanco, Artistic Directors of Music at the Mission, Chamber Music Outside the Box. Out of my involvement with their nonprofit grew this trio with flute, piano, and double bass. Christened the Ledge Trio after the Sun Valley estate we first decided to put this together at, it’s an eclectic combo, ideal for music ranging from Haydn to jazz. Most of our repertoire includes arrangements, and thanks to the fine musicianship of these Julliard graduates, the balance and nuances of the group make it an unusual success. Paul and I met almost 20 years ago, teaching at the same college in Northern Idaho. A colleague suggested we play together for a faculty recital and a duo was born, lasting longer than many marriages. Since then, we’ve toured around the US and performed on stages large and small. But I think where this duo excels is in an intimate environment, acoustically amplified, with the audience within touching distance. The music we’ve been drawn to so far varies from Bach’s Baroque sonatas, to Brazilian choros and the tango music of Astor Piazzolla, to contemporary atonal music like Joan Tower’s Snow Dreams. We also began composing together a decade ago. First as an exercise: with my love affair with melody vying with his musicologist’s obsession with harmony; then as a way to incorporate my Native American flute into our repertoire, with the piece Ghosts of the Ancient Lake. This was conceived sitting at a campfire on Lake Pend Oreille, and is often the biggest hit on a concert program. Our concerts always have an informal dialogue, with comments ranging from Paul’s musical anthropology to my emotional insights into the thoughts and feelings of the composers whose music we represent. 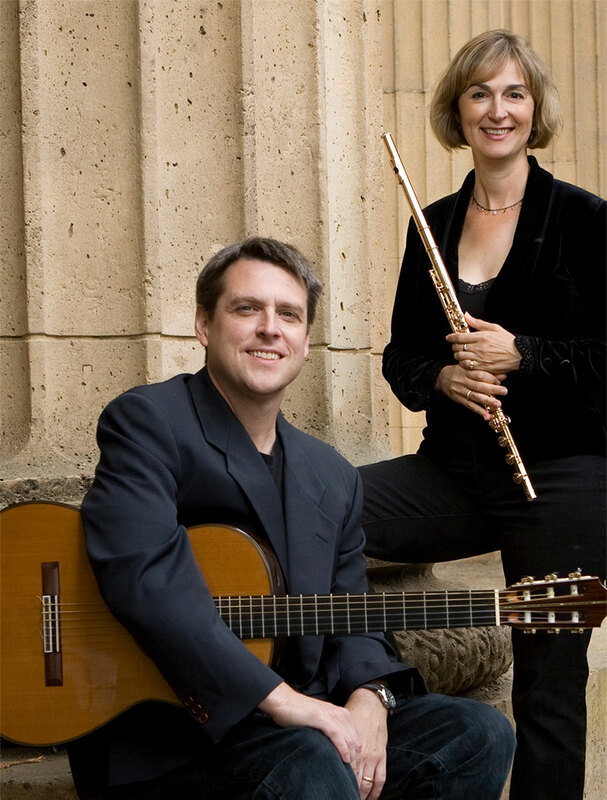 Rhonda Bradetich and Paul Grove mesmerized our audience on Friday, February 15, when they played on our recital series. The flute and guitar combination was brilliant and their program “Music From the South” featured classical and jazz music from the Deep South, South American and Southern Europe.